& share my spirit of adventure. Sun Dog keeps us inspired! The Shadow Campaign // Sun Dog from DPS SKIS on Vimeo. My pups, Big-Lu & Little-Lucy love adventure as much as me. We are always inspired by others and their amazing stories. We found Sun Dog, a truly inspiring film about a snow dog and his person! It made us want to hit the backcountry on our snowboard, feeling the wind on our face and the fresh powder beneath us. As an avid hiker and backpacker, a lot of the fun is have my pups join me in as many adventures of possible. 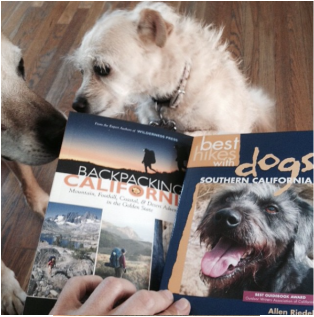 I recently discovered a great book Best Hikes with Dogs, Allen Riedel. After spending some time thumbing through it, it was a must have. The book is organized so well. Each hike comes with a full description and a topo-map with elevation gain and loss. Most of the hikes are under 6-7 mile. Which is perfect. It is also organized by wilderness regions, greater Los Angeles & greater San Diego areas. A bonus was the trail etiquette for dogs and the people who hike with them. Perfectly organized in my opinion. I thought a fun challenge would be to hike as many and as often as we can. We do a daily sunrise hike so the three of us are very strong hikers. But I thought it would be really nice to spice things up and hike some new trails in the San Gabriel mountain area and Angels National Forest to being with. Then venture out into some other wilderness areas. Keep an eye out for some trail talk and wiggle waggle pictures as we adventure out and do some new discovering.